Gov. Pawlenty says he wants to step in and revive a Twins stadium proposal that's currently on life support. Pawlenty said he's willing to meet with Twins executives and members of the Hennepin County Board to make sure that an agreement between the county and the team does not expire this weekend. The Twins and the County Board have agreed on a plan to increase a countywide sales tax to help build a $478 million stadium in downtown Minneapolis. But officials with the Twins and the county board say there's no guarantee the stadium plan will survive, even with the governor's help. St. Paul, Minn. — Gov. Pawlenty says he's willing to sit at the negotiating table to make sure the Twins stay in Minnesota. He met for 45 minutes with two Hennepin County commissioners to show his support for the stadium agreement. He says the team is an important state asset. "They're not going to stay at the Mmetrodome in the intermediate and long term; that's just obvious. We need as a state to keep our Minnesota Twins so we need to find a reasonable stadium solution. I think most legislators understand that. Whether they like this particular deal or not, we'll see. But it is one that is viable and reasonable," Pawlenty said. Pawlenty says he hopes the County Board and the team can negotiate a new deal in the next month so a bill could be ready when lawmakers return to the Capitol in March. But if the governor is willing to come to the negotiating table, it's not clear officials from the Twins and Hennepin County Board will be there with him for long. Hennepin County Commissioner Mike Opat says he's pleased Pawlenty is taking a more active role in the negotiations. For months, Opat has expressed frustration that the Legislature did not approve the stadium deal which came together last spring. Under the agreement, the county would increase its sales tax .15 percent -- the equivalent of 3 cents for every $20 spent. The county would also make road and infrastructure improvements to the site. Under the agreement, the county's contribution to the project totals more than $350 million. 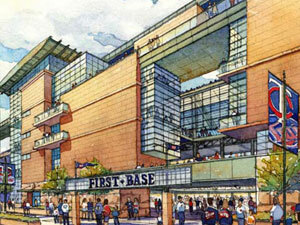 The Twins were willing to spend $125 million on the facility. Opat says it's nice to have Pawlenty at the table, but he isn't sure the governor's political muscle will make a difference. We had an agreement there that didn't include any state money and we couldn't even get a vote. There is nothing in my view to be optimistic about. "If the governor is personally engaged in it, that may be a reason to do it again," he said. "But there's a political cost to the Hennepin County Board to come over here and work on this statewide asset and we're cognizant of that and we're going to make sure all of the parties are interested in negotiating something new before we start again." Opat says part of the problem is the stadium will cost $30 million more to build because of inflation. He says the County Board isn't willing to spend any more money on the proposal, so the state, the team or the city of Minneapolis would have to come up with the additional money. The other major question is whether lawmakers will approve a deal that helps the team's billionaire owner, Carl Pohlad, in an election year. Pawlenty was willing to call a special session to take up new stadiums for the Twins and Gophers, but it never happened because state lawmakers couldn't reach agreement on the specifics. Jerry Bell, lead negotiator for the Twins, says he's not sure meeting with Pawlenty will make any difference. "Why would I be optimistic? We've been at this 10 years. We had an agreement there that didn't include any state money and we couldn't even get a vote. There is nothing in my view to be optimistic about," Bell said. Some lawmakers say they're not willing to spend any public money on a Twins stadium. Others say they want Hennepin County voters to have their say on the sales tax proposal in a countywide referendum. Both the Twins and the county say a referendum would further delay construction and increase costs. Laura Lehmann, with the Citizens for a Stadium Tax Referendum, says the Twins and the County Board are afraid the proposal would be defeated at the ballot box. She says it's important that the voters have their say on the proposal. "By Minnesota law, a sales tax requires a referendum and especially for something, a discretionary item such as this. I mean, we have to vote whether we're going to spend money renovating a school gymnasium," she said. Gov. Pawlenty says he'd prefer to see a referendum as a part of the deal but says it isn't a requirement if the Twins or the County Board consider it a deal killer. It's not clear when the governor will meet with negotiators for the Twins and Hennepin County Board.